Within a 24-hour period in early February, the Stanley Cup visited two of the highest ranking individuals in the world. First, the Cup was a guest of President George W. Bush at the White House, the seat of government in the United States of America. Then, it paid a visit to Rideau Hall as the guest of honour of Michaelle Jean, the Governor General of Canada. On the morning of Friday, February 2, the Stanley Cup was flown with the reigning Stanley Cup champion Carolina Hurricanes to Washington Dulles International Airport, located in Dulles, Virginia, about 25 miles from the White House. The Carolina squad was giddy with excitement, anxious to see the White House and meet President Bush. The plane landed late in the morning, and waiting at the Dulles Airport were three guests who added a surprising and very emotional touch to the official proceedings. Matt Cullen and Aaron Ward, now playing with the New York Rangers, were given permission to join their Stanley Cup teammates for the occasion, while Martin Gerber was given the same privilege by his current team, the Ottawa Senators. It certainly made the celebration complete. The team went on a sightseeing tour of Washington, D.C. "On September 11, 2001, a disaster befell our country," started the tour guide. You could hear a pin drop on the bus. "American Airlines flight 77 was crashed into the Pentagon here in Arlington County, Virginia." Every player and team official scurried over to the right side of the bus to observe. The tour continued, with the guide pointing to monuments of great significance. "You'll note that, to your right, is the Canadian Embassy," stated the guide. "It is the embassy closest to the White House." 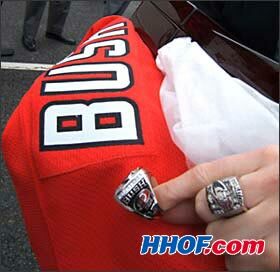 a 2006 Stanley Cup ring. The bus carrying the Carolina Hurricanes and the Stanley Cup arrived at 1600 Pennsylvania Avenue Northwest. Beyond the fact that it is the seat of power in the free world, the White House is a magnificent structure, comprised of six floors and 132 rooms, including thirty-five washrooms. 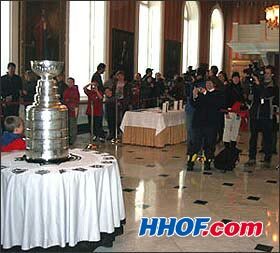 After security cleared each of the players and officials present, including the dog sniffing the Stanley Cup, the guests were escorted to the East Wing where they received a briefing prior to their reception with President Bush. The Hurricanes got the opportunity to examine the impressive presidential portraits in the Wing, and were allowed to poke their noses into several different rooms. At 2:13 PM, President Bush entered the room, and the team was beaming like it was picture day at public school. The president has a wonderful sense of humour, and exhibited it as he began his address to the Stanley Cup champions. "It's a pretty big deal for a guy that doesn't know how to ice skate to welcome the Carolina Hurricanes to the White House. We appreciate you coming," he began. "Y'know, I'm not sure what's prettier, the Stanley Cup or Mike Commodore's hair!" The entire team howled at the reference to their popular teammate. "I'm a little disappointed you got a haircut, but, welcome," added the President. Commodore couldn't resist, and thanked the president. But the teasing wasn't quite over. "I was a little surprised to see that he's not wearing his robe!" The big defenceman blushed, turning as red as his hair. President Bush continued. "At the start of this season, this team was ranked twenty-eighth out of thirty teams. I like to be around people that keep expectations low!" 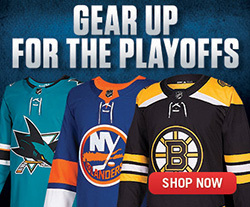 General manager Jim Rutherford was laughing so hard, the tears were running down his cheeks. "But instead of listening to the prognosticators, this team had a 112-point season. They had 52 wins. They win the Stanley Cup. They're here at the White House. Congratulations to you!" It was a moment of immense pride for each member of the Hurricanes. President Bush sent his best wishes to team owner Peter Karmanos, who had recently undergone surgery and was unable to attend the White House reception. After congratulating the Karmanos family and Jim Rutherford, the president acknowledged the rest of the Hurricanes. "I welcome the captain of this team, Rod Brind'Amour, and the players. I appreciate the coach. Peter, you've done a heck of a good job. It's not easy to be a coach of a successful team, and I appreciate the spirit that you brought to this club." As a former owner of Major League Baseball's Texas Rangers, the president has an appreciation for the efforts of the unsung heroes who help make successes occur. "I want to thank all the people associated with this club. I particularly want to pay tribute to the equipment managers and the locker room people. Players get all the credit and all the glory, but they would tell you firsthand, they wouldn't be able to skate every day if somebody wasn't there making sure that the uniforms were ready and doing all the hard work. The games end late. These folks are toiling long into the night, preparing for the next day's practice. And so we welcome not only the players and the management and the coaches and the families, but all those who make a successful franchise run. We're really glad you're here at the White House." Several others distinguished guests looked on, including NHL Commissioner Gary Bettman. Although it's not the first time the Hurricanes had come face to face with senators, the kind this Carolina team faces usually includes Jason Spezza and Wade Redden. On this date, however, Senators Bob Dole and Richard Burr were on hand to observe the ceremony, as well as Congressman Howard Coble, who was proudly sporting a baseball cap from the Carolina Hurricanes. In addition, several hockey teams were in attendance, and the youngsters were also mentioned by President Bush. "I want to welcome the young hockey teams that are here, the local Virginia state teams. Thanks for coming to see what champs look like. The idea is to skate hard, work hard, and make the right choices and someday, you'll be standing up here at the White House!" With heads nodding in agreement, the president added a further tag that made the crowds chuckle. "I'm probably not going to be here." President Bush, who clearly has enjoyed reading 'Stanley Cup Journal,' made mention of a number of events that took place over the summer with the Stanley Cup champions. "Hurricane players took the Cup on many adventures. It went to Russia, Ukraine, Sweden, the Czech Republic, of course, Canada and the United States. Goalie Cam Ward took the Cup home to Canada and he ate some corn pops out of it. And then he took it to visit his grandmother, and the other residents at the seniors' home where she lives. He used the Cup to bring some joy in people's lives." There was a clear message being delivered as the president continued outlining player's adventures with the magnificent Stanley Cup. "Several players took the Cup to children's hospitals in their home towns. The captain of the team brought the Cup to a charity golf tournament, where he helped raise $112,000 for the fight against cystic fibrosis. Defenceman Glen Wesley took the Cup to the Wounded Warriors Barracks at Camp Lejeune. Here's what he says: 'What better way to thank the troops who fight for our country and defend our freedoms.' And I appreciate you doing that, Glen." Then, President Bush told the story of Peter Laviolette. "A lot of people inspired the Carolina Hurricanes on their way to victory, but none more than a young girl named Julia Rowe. Julia lives just down the street from the coach. They're buddies. As the playoffs approached, she learned that she had suffered a relapse of childhood leukemia and would have to undergo intensive chemotherapy and a bone marrow transplant. Inspired by Julia's fight, these tough guys launched a campaign to raise money and awareness for the fight against leukemia. Julia followed every moment of the Stanley Cup finals from her bed in Duke University. She got to join the team on the victory parade. The coach reports that today, she's back home and doing well. She's incredibly proud of her friends who won the Stanley Cup." In conclusion, President Bush punctuated the anecdotes with a valuable lesson, delivered with his usual humour. "What I'm telling you is, this group of men, they're a class act. They're obviously great athletes -- all you have to do is look at their noses to know that!" The guys laughed heartily, but roared as the president threw out another zinger: "Appreciate you putting your false teeth in!" But President Bush then continued with a more serious message. "More important to me is the fact that they've got good hearts, and they bring class to their profession. They set an example for young folks who watch them perform on the ice." Reference was made to a motivational sign that hangs in the Hurricanes' dressing room. It reads: 'It's not about me, it's about the guy in front of me.' President George Bush punctuated the visit with his thanks. "One reason they're here is because they understand that when you serve something greater than yourself, the team or your community, you become a true champ. And so, on behalf of the White House people, we welcome you. Congratulations to true champs. God bless." Jim Rutherford presented the president with a Carolina jersey as well as a Stanley Cup ring, the first time a team has ever given a head of state such a special memento. Regrettably, the reception concluded as quickly as it had arrived. Within twenty minutes, President Bush had made his exit and the team was marshalled out of the White House. The current team took a charter back to Carolina while the Stanley Cup traveled once again to Dulles Airport, this time in the company of Messrs. Cullen, Ward and Gerber, who, once there, were heading off in various directions in order to hook up with their respective teams. There is little doubt that the White House trip made the three somewhat melancholy, in spite of the fact that they are greatly enjoying their new situations. Nonetheless, to paraphrase the sage words of Fred Shero, coach of the 1974 Stanley Cup champion Philadelphia Flyers, the 2006 Carolina Hurricanes won together as a team, and will now walk together forever. The Stanley Cup arrived back in Toronto late on Friday, February 2, and was prepared for a new adventure that the next day, would return it to its birthplace. When Lord Frederick Stanley arrived on Canadian shores in 1888, ready to assume his role as Canada's sixth Governor General, he had never heard of the game of hockey. But an avid sportsman, as were his seven children, Stanley and his family were always game for new challenges. On February 4, 1889, Lord and Lady Stanley and their party, which included son Edward and daughter Isobel, observed their first hockey game during the Montreal Winter Carnival. Seated at the Victoria Skating Rink, the Stanleys watched the Montreal Victorias edge the Montreal Hockey Club by a score of 2-1. Her Excellency Michaelle Jean, Governor General of Canada poses for a photo with the Stanley Cup. The commissioned trophy, purchased in London, England, was engraved with the Stanley family crest on one side and the Governor General's proposed name on the other  Dominion Hockey Challenge Cup. 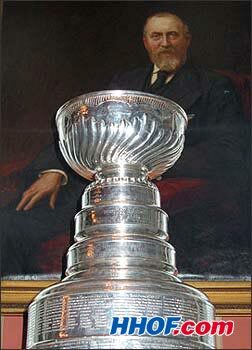 From the moment it arrived at Rideau Hall in May 1893, it was referred to as the Stanley Cup. But by the time the Cup arrived, Lord Stanley was already making plans to leave Canada for England. Upon the unexpected death of his brother, Edward, on April 21, 1893, Lord Stanley immediately succeeded his brother as the Earl of Derby, and was forced to conclude his term as Governor General several months prematurely. The new Earl of Derby never witnessed the presentation of his Cup, won that first year by the Montreal Hockey Club, part of the Montreal Amateur Athletic Association. Therefore, the idea for hockey's championship trophy was born at Rideau Hall in Ottawa, prompted by Stanley's children, who often played on the adjacent Rideau Hall Rink. On Saturday, February 3, the Stanley Cup, looking substantially different than the one that arrived at the same location in May 1893, was returned home to its birthplace. The idea originated because of the Hockey Hall of Fame's biography 'Lord Stanley: The Man Behind The Cup,' co-written by Kevin Shea and Jason Wilson, and was embraced by the Governor General's office. Duncan Mousseau, the Director of Programming and Planning for Rideau Hall, was responsible for executing the idea of bringing the Stanley Cup home to the place of its birth. The event was built into the Governor General's Winter Celebration, which coincides with the immensely popular Winterlude, held by the City of Ottawa beginning each February. The plane containing the Stanley Cup was delayed by more than an hour in Toronto, but arrived in Ottawa safe and sound, escorted by a vehicle sent by Rideau Hall. The trophy, polished and gleaming, was taken to the Tent Room, at one time a vice regal tennis court, but today, a magnificent hall with portraits of British-born Governors General hanging elegantly from the walls. Lord Frederick Stanley's portrait, created by Sir Hubert Von Herkomer, hangs near the entrance to the room on the right hand side. Two minor hockey teams had earned the privilege to visit Rideau Hall and get their photographs taken with the Stanley Cup. Mindful of the reverence that permeates the hall, the young boys, each wearing their team jerseys, were led to the front of the hall, and gasped when they approached Lord Stanley's trophy. The official Rideau Hall photographer took their pictures, and they left with great memories that will endure a lifetime. 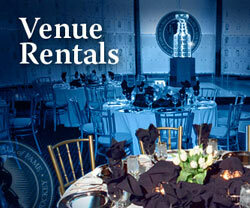 The Stanley Cup was placed at the far end of the Tent Room. Between the entrance and the trophy were several tables with displays of Lord Stanley's biography and photographs of Lord Stanley, his family and hockey teams popular during Stanley's term as Governor General (1888 to 1893). It was a slice of an era few of us fully appreciate, but Mr. Mousseau was outstanding in showing the authors where certain photographs would have been taken, the Rideau Hall Rink and other historic areas pertaining specifically to Lord Stanley or hockey. Rideau Hall in Ottawa, Ontario. The public had been invited, and word filtered to the Tent Room that more than a thousand guests were waiting in line to see the Stanley Cup. The Governor General's Winter Celebration not only included the Stanley Cup, but also spectacular outdoor activities like dogsledding, hayrides and skating. Hot chocolate and maple taffy were also available, and all free, like the activities, for any visitor who chose to visit 1 Sussex Drive that day. At 11:30, Her Excellency Michaelle Jean, His Excellency Jean-Daniel Lafond and their daughter, seven-year-old Marie-Eden, entered the Tent Room and immediately strode over to the Stanley Cup. Her Excellency was in awe, and carefully placed her hands on the silver patina of Lord Stanley's legacy. Sporting an outstanding red hockey jersey with a maple leaf emblem on the chest and Rideau Hall crests on the shoulder, Madame Jean examined the Stanley Cup, mentioning names of some of the great teams and players she discovered as she ran her finger along the engravings. The Governor General and her husband were then introduced to Kevin Shea and Jason Wilson, authors of the Lord Stanley biography. "Oh, this is going to be a bestseller for sure," she exclaimed, and was then presented with her own copy of the book. "How could it not be? It's about Canada's history and its favourite sport!" Then, Their Excellencies were introduced to Philip Pritchard, the Keeper of the Cup from the Hockey Hall of Fame. "You know you have the greatest job in the world, don't you?" stated the Governor General. "Well, yes, I guess I do, but you've got a pretty great job, too," Phil said, making the Governor General laugh. Awaiting photographers snapped off shot after shot while TV cameras caught all the activity. "Lift up the Cup," suggested one photographer, and turning to Phil, the Governor General asked, "May I?" "Sure, but we ask that only Stanley Cup champions hoist the Stanley Cup over their heads," explained Pritchard, explaining protocol. "Don't you worry. I haven't earned that right," chuckled Her Excellency. After an explosion of light from the cameras caught every moment of the Governor General's embrace of the Cup, Their Excellencies were introduced to the Fenn family, publishers of 'Lord Stanley' as well as the Hockey Hall of Fame's other books. Harold Fenn, the company founder and president, had come in to Ottawa from Toronto with his wife Sylvia. Publisher Jordan Fenn, their son, had arrived by train with his wife Kim and adorable son Stewart. Mike Fenn, Jordan's brother and a huge hockey fan, was also present. The Governor General took special interest in two-year-old Stewart, who will have to be reminded of the special day through photos as he slept through the reception with Their Excellencies. Michaelle Jean and Jean-Daniel Lafond are wonderfully warm individuals, full of life and genuine affection for people. Worried about protocol but sensing that the Governor General was open to a little fun, Phil Pritchard shyly asked the Governor General for a favour. "My son, Quinn, is reading a book titled 'Flat Stanley,'" he began. "As part of the book, each reader is to create their own Flat Stanley and get pictures taken with their Flat Stanley in fun and exciting places. I can't think of a place more exciting than Rideau Hall, Your Excellency, and I'm wondering if you will have your picture taken with Quinn's Flat Stanley beside the Stanley Cup?" While everyone laughed, the Governor General gladly took Flat Stanley and said, "I'd be happy to. I have been asked before, you know!" The cameras whirred with activity, catching Flat Stanley and the Stanley Cup with Governor General Michaelle Jean. With warm handshakes and kind words, Their Excellencies thanked all participants for visiting Rideau Hall and wished all well. At the back of the room, hundreds of fans, anxious to get their picture taken with the Stanley Cup, began filing into Rideau Hall's historic and magnificent Tent Room. It was twelve noon, and for the next three hours, fans examined the photographs of Lord Stanley's era, then stood happily beside the Stanley Cup for the souvenir of a lifetime. At 3:00 PM, in need of returning to Toronto for another function, the Stanley Cup was picked up by Phil Pritchard, the Keeper of the Cup. "Ahhhh!" rang a chorus, knowing that time had evaporated yet with a couple hundred more fans still waiting to see the trophy. "No one will leave disappointed," he promised, and walked the Cup past each of the fans, who got a chance to take a quick picture or place their hands on the special trophy. Outside in the crisp Ottawa air, with the bite of skates on ice prominently heard in the distance, Pritchard packed the Stanley Cup in its case. A spontaneous round of applause ensued. It had been a magnificent day! No, in fact, it had been consecutive magnificent days! Kevin Shea is the Editor of Publications and On-Line Features at the Hockey Hall of Fame.